This simple tossed salad is one that will go with just about any meal, any time of the year. And although basic, what makes it special is the addition of homemade crunchy croutons flavored with garlic and herb. Drizzled with an easy red wine vinegar dressing, this salad feels complete, but couldn't be easier to prepare. The salad is also extremely versatile. It calls for romaine lettuce leaves, red leaf lettuce, and some radicchio or endive, but feel free to use your favorite greens. You can also make it heartier by adding chicken, hard-boiled eggs, or chickpeas. With the protein, it makes a great supper salad for a hot summer evening. Note: while there are multiple steps to this recipe, this salad dish is broken down into workable categories to help you better plan for preparation and assembly. You can either leave the crust on the bread or trim it off if you prefer. Cut the bread into 1/2-inch cubes and put in a bowl. Drizzle with extra virgin olive oil and sprinkle with the basil or dill; toss to coat. Spread the bread cubes out on a rimmed baking sheet and sprinkle lightly with the garlic powder and some kosher salt. Bake for about 12 to 15 minutes, turning every 5 minutes or just until browned. In a large bowl, combine the romaine lettuce, mixed greens, tomatoes, radishes, onion, and carrot. Toss well. Top with sliced cucumbers and olives, if using. In a jar with a screw-on lid or another type of container with a lid, combine the extra virgin olive oil, red wine vinegar, and sugar. Shake to blend. Taste and add salt and freshly ground black pepper, as needed. Keep refrigerated until serving time. 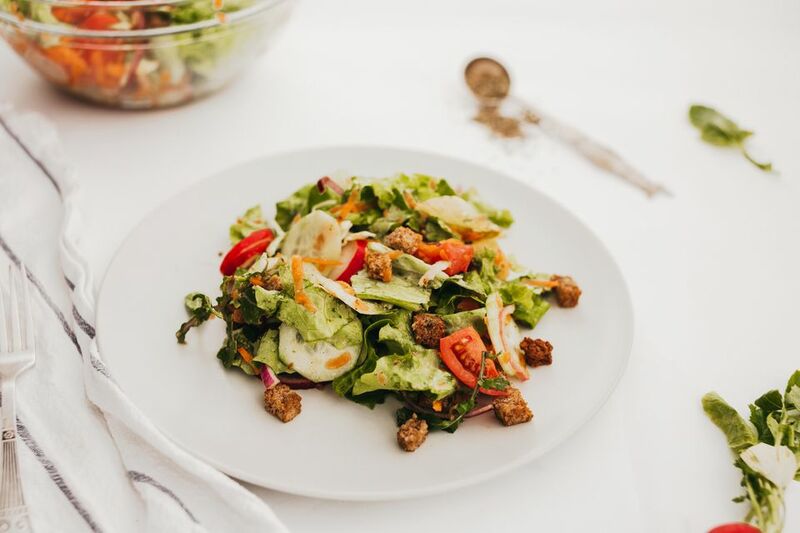 To serve the salad, toss with dressing and top with croutons; or top individual servings with the croutons and pass the dressing at the table. Of course, a salad is a perfect recipe to add your own personal touches to. Feel free to swap out any ingredients you don't care for and replace with your favorite vegetables. You can also add crumbled bacon, grilled chicken strips, or diced cooked ham to the salad. Cheese is always a welcome addition; toss in about 1/2 to 1 cup of shredded cheese to the salad, or sprinkle the salad with crumbled feta cheese. Add 1/2 cup of toasted slivered or sliced almonds or pecan halves; the nuts contribute extra flavor and crunch. If you prefer, you can replace this dressing with a homemade buttermilk dressing, a balsamic and mustard vinaigrette, or a purchased salad dressing.